Elita One, the leader of the renegade female Autobots on Cybertron, and now in the IDW comics the captain of the prison ship Carcer and leader of the Carcerians, is put into plastic form thanks to Iron Factory as Alleria. This figure is included as a bonus with first run editions of Iron Factory's Ultimate commander figure. Alleria is a retool of their IF-EX16 Pink Assassin figure. I've reviewed that figure here and I would advise you to check out that review for in depth details about articulation and figure quality for this mould. I'll mainly be focusing on what Alleria does differently, and how she stands out next to the rest of Iron Factory's girls. 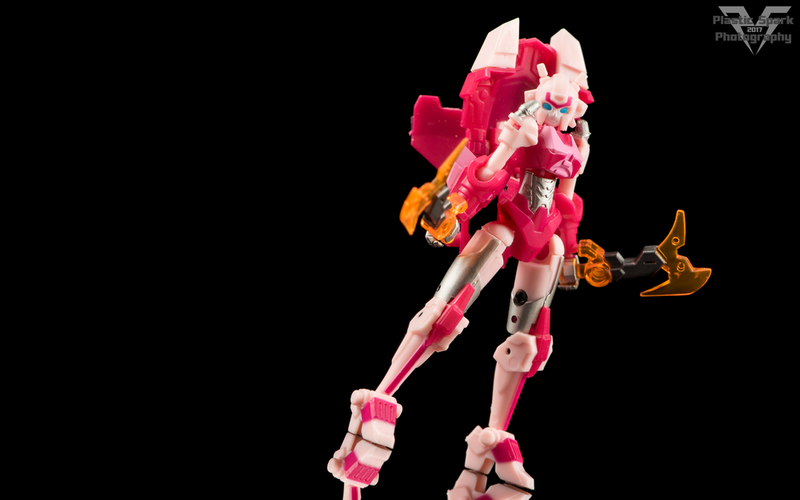 Cutesy pink robot + brutal looking energon blades makes me one happy collector! The main changes here aside from the color layout, are the addition of a new head, and new axe weapons. The head and axe are both unique and have not been pulled from any previous release. 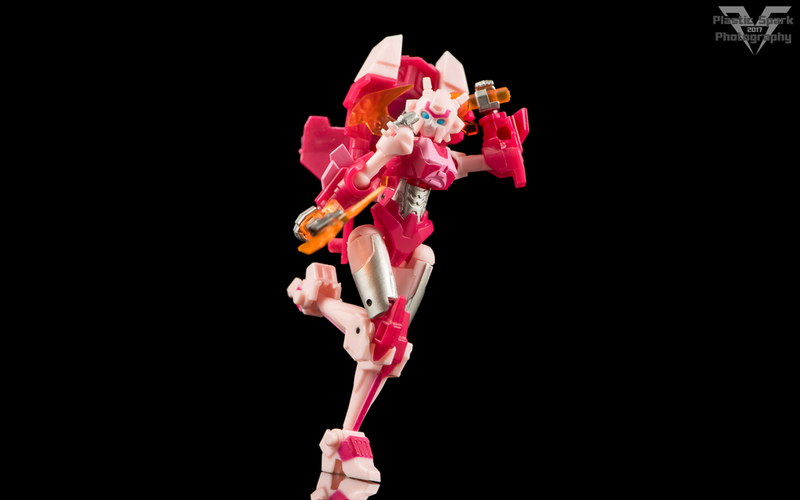 The Elita One style head with tiny antennas is very cute and well executed. There is a lot of personality here and I loved posing and playing with this one as much as the original release. The small translucent axes are a lot of fun and look very cool in Alleria's hands. Plastic quality is excellent and her articulation and balance are all on par with the original release. The vehicle mode is identical to the original release, and still can't really balance in any nice way without support. It will tip backwards if not supported in some way. It's fun but basic, certainly not the strong point of the figure. 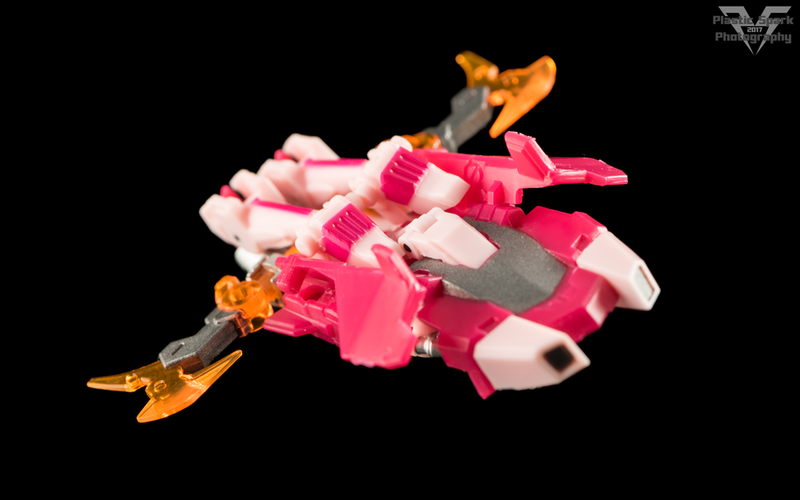 Like with Pink Assassin I fashioned myself a new flying fan mode that can be achieved using the axes mounted in her hands. This is not an official mode from Iron Factory, just something that I came up with while messing with the figure. I find it a bit unfortunate that Alleria is only available with Ultimate Commander. While Ultimate Commander is a nice figure, one of the appealing aspects of the Iron Factory fembots is that they have for the most part been affordable smaller purchases. It would be nice to see Alleria made available on her own, maybe with a couple more accessories and an included flight stand like the other 2 versions of this mold. 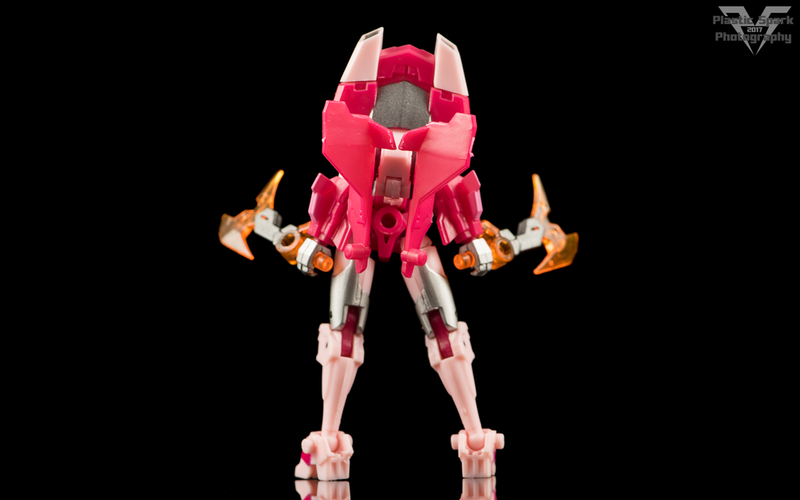 I really like what Iron Factory is doing with these small, almost chibi style fembots. I'd love to see a couple more unique molds join the team down the road, maybe a truck/SUV type for Firestar or Chromia. Here's hoping Iron Factory has plans for more! If you already had plans to pick up Ultimate Commander (Review coming soon) then I would definitely recommend trying to get the bonus version that comes with Alleria. You can tell by the front of the box for Ultimate Commander as there is a special label indicating her inclusion. Robot Girl Squad! Ninja chick! Flying lady! The pink one! The more famous pink one!